It’s time to dig all your saris out of your wardrobe as saris rule the Indian fashion runway yet again. The Lotus Make-Up India Fashion Week finale was an ode to the sari, worn by the runway models in modern, reconstructed forms, along with elaborate jewellery and accessories. New Delhi: It’s fashion season in India’s capital, with the country’s top designers showcasing their latest collections to lure the rapidly growing domestic and export markets for Indian haute couture. Before the styles debut on the runway lie days of planning, fittings and hair and makeup sessions to experiment with looks, poses and choreography. Just days ahead of the big show, tailors take models’ measurements and fashion designers finish rehearsing. Top fashion names and models participated in Lotus Make-up India Fashion Week organised by the Fashion Design Council of India earlier this month. The show celebrated the sari, Indian women’s most idiosyncratic garment, 6 yards of fabric that symbolise a centuries-old tradition. 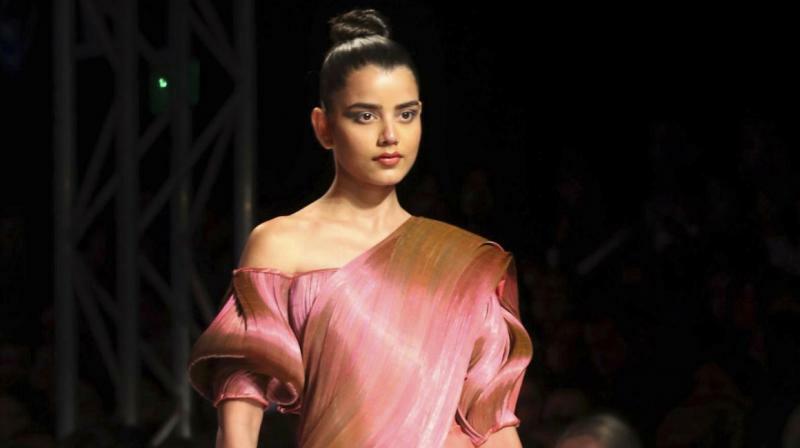 “As a long piece of fabric, it’s not easy to drape, a lot of designers have worked on it over time and it is being styled differently to inspire the younger generation to wear,” Vaishali S, a Mumbai-based designer, said of the sari. Models sashayed down the runway in a riot of colour and glitz as Delhi socialites, Bollywood stars and prospective buyers watched for the season’s next “it” items. The sari was juxtaposed with other Indian ensembles, Western wear and fusion clothing collections for men and women. The show finale was an ode to the sari, worn by the runway models in modern, reconstructed forms, along with elaborate jewellery and accessories against striking backdrops. Vaishali said the saris on the runway paid tribute to the great variety across India of “weaves, textures, drapes and fabrics with every state and every village having its own strongly distinct and contemporary style, alive and evolving.” At the end, avid fashionistas in the audience blended in with fashion models as buyers thronged the stalls of designers, who offered their creations for sale, pret-a-porter.